Trip Outline: Click on highlighted text to see trip report for that day. 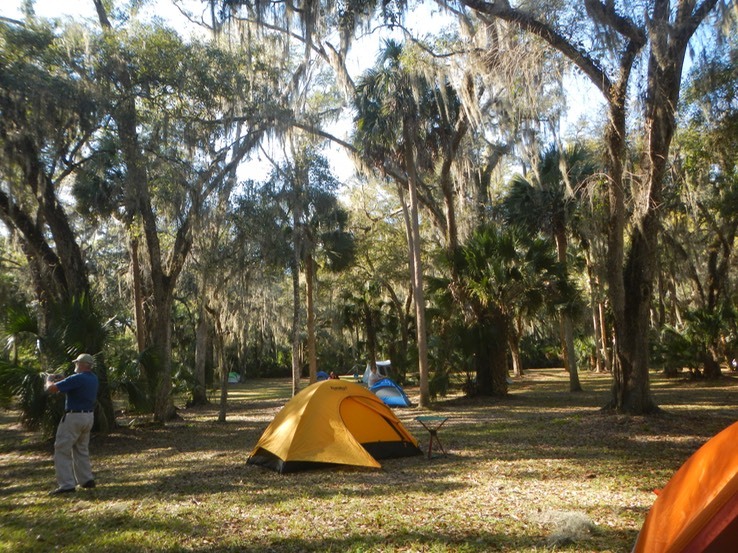 Day 2 - Monday February 16: Marsh Bend Outlet Park to Potts Preserve Primitive Campsite. (Map #2) Strike camp, breakfast, on the water, lunch, arrive, set up camp, Dinner, evening presentation by SW Florida Water Management District. Day 3 - Tuesday February 17: Potts Preserve to Rainbow Springs State Park. (Map #3) Strike camp, breakfast, on the water, lunch, arrive, shuttle to camp, set up camp, Dinner, evening musical presentation by “Patchwork”. Day 4 - Wednesday, February 18: Layover day. (Map #3) Sleep in, breakfast, hike, paddle, dry out, soak up the sun as you like, dinner, presentation by Mary Mangiapia, Florida Circumnavigation Trail through paddler. Day 5 - Thursday, February 19: Rainbow Springs to Inglis Lock and Dam: (Map #4) strike camp, breakfast, on the water, cross Lake Rousseau, lunch, arrive, set up camp, Dinner, evening presentation on the Marjorie Harris Carr Cross Florida Greenway. Day 6 - Friday, February 20: Inglis Lock to the Gulf of Mexico and Bird Creek Park. (Map #5) Strike camp, breakfast, on the water, lunch at Yankeetown Women’s Club, arrive at Bird Creek Park, shuttle to cars. This trip was organized by Paddle Florida, Inc.
Paddle Florida, Inc. is a not-for-profit 501(c)(3) corporation organized to support canoeing and kayaking in Florida. Events in each of Florida's five water management districts expose paddlers to Florida's natural beauty and rich cultural heritage while promoting water conservation, wildlife preservation, springs restoration and waterways protection. Paddle Florida also seeks to promote Florida as an international destination for nature-based tourism. Trips feature Florida's most scenic rivers, canoe trails and coastal environments, including the Florida Keys and the Suwannee, Wekiva, St. Johns, Ochlockonee, Peace, Withlacoochee and Rainbow Rivers. I had wanted to take this trip for several years. But because I also wanted to paddle with some old friends from the north who only seemed to have the week of this trip available to paddle here in Florida, I could not. That changed this year and I was finally able to paddle the “Wonderful Withlacoochee”. And wonderful it is. 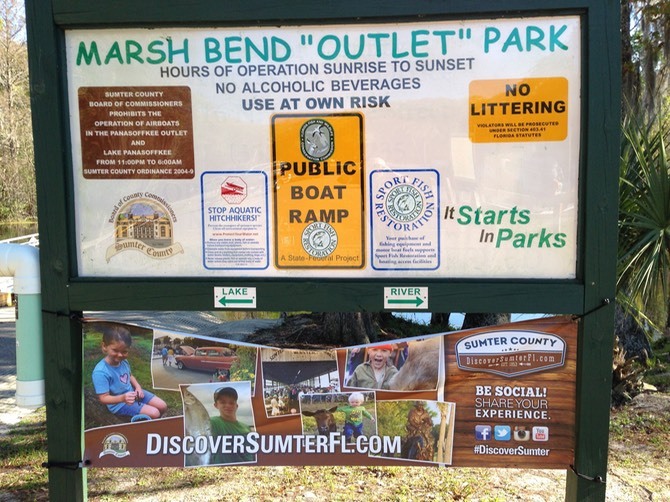 Although it has been dammed in several places, it has largely avoided channelization, preserving the winding twists and turns of a truly wild river (Click here for information on the Cross Florida Barge Canal, the reason for the river being dammed). Its banks are lined with giant Cypress trees wearing heavy coats of Spanish Moss. In many places the river flows deep into the surrounding forest as far as the eye can see. The river is rich with bird life. On our second night out, camped at Potts Preserve, we watched as several flights of dozens of Ibis passed over, heading for their evening roost. On the water, groups of Ibis and Coots foraged until spooked by our passing, sending clouds of white and black, squawking into the blue sky. The solitary birds were present in abundance too. Heron of all types, Egrets, and the odd solitary Limpkin. Osprey, eagles, hawks and Kingfishers were seen. On our first warm day the logs along the bank were studded with dozens of sunning turtles, most bigger than dinner plates. A gator was spotted as were raccoon, wild hogs, and otter. One of the things I love to focus on is the sounds on the river. That’s what this video is all about. This is the video portion of my review on this new tent. It was a pleasant day, not too warm but warm enough to bring out the mosquitos! We set up camp in an open forest area and prepared for our early morning departure.